Some time ago, I became friends online with Michael Horvich, and this poem not only moved me to tears, it helped me see the role of the family care partner differently, as if somehow it had softened my edges. I have been reading his poems again today, after learning the news of his partner Gregory’s imminent death. After discovering a couple of hours ago that Gregory has pneumonia and is not expected to live much longer, I cried for some time, and although we have never met personally, I feel deeply connected to them both, and I am quite sure, not only because I share dementia with them. I’ve also been re reading the poetry book Michael sent to me some time ago in honour of them both as they face this together, one perhaps more aware than the other, although that is not for certain. Perhaps it is because we are both poets, or have found blogging one way to help heal our grief and pain, or perhaps it is just that way with some people. I ‘know’ Michael and Gregory are a couple who love each other deeply, and that the hole in Michael’s heart when Gregory dies will be huge, and it will take some time for the pain of the loss will be replaced with the memories of love. I have been there, I do know grief intimately. I also ‘know’ I love them, even though I have never met then in person. Farewell Gregory for when your time comes… and much love and respect to you and Michael. 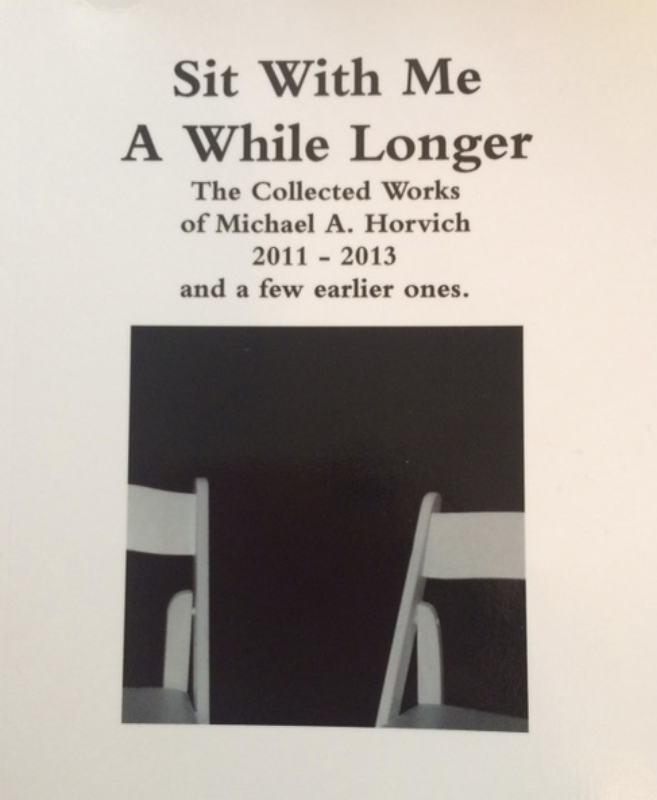 With Michael’s permission, I am re publishing it here exactly as it was produced in his book, Sit with me a While Longer: The Collected Works of Michael A. Horvich, 2011-2013, p 47. All we really had was time. All we really had was today. All we really had was each other. I shared mine with you. We shared our life a while. And the stories will cease to exist. Michael’s blog is a beautiful tribute to the man he loves, and it honours his partner Gregory beautifully, and their life together. michael a. horvich cares about alzheimer’s disease. On the home page, it says; This BLOG is dedicated to Gregory, not a victim of Alzheimer’s but a hero. It is meant to share our Journey with family and friends and to let those traveling their own path know that they are not alone in loving and caring for someone with Alzheimer’s Disease. Please feel free to share the link with anyone and everyone who you think might benefit. It’s a wonderful poem, in its simplicity it cuts out all the inessentials, the complications which the world throws into our lives. Michael and Gregory simply are, it seems to say. They simply are and that is all they need. Kate, my tears blur your post and my comments. I feel your love, and your hugs. Most importantly to feel the respect and admiration from someone who I in turn respect and admire so much overwhelms me. Our friendship has been brief, and at a great distance in miles but I feel its strength and I feel you sitting here with me a while as I continue to sit by Gregory and hold his hand as he prepares for his next adventure on the other side of life as we know it. I too send you strength, and love, and a big hug and kiss! In case others might find comfort from my poems, many of which have been informed and inspired by Gregory and my journey through Dementia/ Alzheimers they can be purchased from AMAZON or BARNES and NOBEL. The price is $15.00 with $5 going to the Alzheimer’s Association and $5 going to The Lieberman Center, Special Memory Care Unit. $5 covers the price of the printing. Kate, Thanks for sharing Michael’s poem. I’m sure it will mean a great deal to him during this heart-wrenching transition. Although I have been a writer for years, it’s only in the past couple of years that I have discovered poetry as a means to express my feelings in a new way. This new-to-me form has been a godsend in my role as a care partner. Miraculously, Mom is still with us. But there comes a time when we all must say goodbye. Wow – thanks Kate for blogging today. I know you must be extremely tired. Take lots of rest my friend.